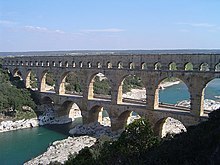 Pont du Gard, Fraunce, a Roman aqueduct biggit circa 40-60 C.E.. It is ane o Fraunce's tap tourist attractions an a Warld Heritage Steid. Brigs for conveying watter, cried aqueducts or watter brigs are constructit tae convey wattercoorses athort gaps such as valleys or ravines. The term aqueduct mey an aa be uised tae refer tae the entire wattercoorse, as well as the brig. This page wis last eeditit on 28 Mairch 2016, at 18:51.